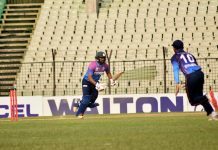 The second day of 5th round of Walton Dhaka Premier Division League 2018-19 have witnessed a nail-biting thriller as Bangladesh Krira Shikkha Protisthan (BKSP) beat Brother Union by 2 runs at SBNCS. Defending 267, BKSP restricted Brothers for 265 for 9 in 50 overs to win the match. Shinepukur Sporting Club defeated Uttara Sporting Club comprehensively by chased down the target of 146 in just 25.1 overs with 8 wickets remaining. Sabbir Hossain was the standout performer for Shinepukur who scored 99 followed by 3 for 27 with the ball. Prime Doleshwar Sporting Club won the other match of the day by beating Khelaghar Samaj Kallyan Samity by 7 wickets thanks to Saif Hasan’s unbeaten 132. Result : Bangladesh Krira Shikkha Protisthan (BKSP) won by 2 runs. Result : Shinepukur Cricket Club won by 8 wickets. Result : Prime Doleshwar Sporting Club won by 7 wickets.